It's rare that you can get a spaghetti squash at our local grocery store, so if you see them, you better grab one. The second they put them out, they are quickly gone. I found one on my trip to the store this morning and was in the mood for some carbonara. So, that is what's for dinner at my house tonight. I haven't made it in a while. Cut spaghetti squash in half, remove seeds, place face down on a baking sheet. Bake spaghetti squash in the oven at 350 for 40-45 minutes. While the squash is cooking fry up the bacon in a skillet. When bacon is crispy remove from heat and set aside. Next whisk in the arrowroot powder to the bacon grease and let cook for a few minutes. While the arrowroot powder cooks combine the coconut milk, eggs, and seasonings in a bowl. Pour egg mixture into skillet and let cook in bacon grease, stir frequently. Cut cooked bacon in to pieces and stir into egg mixture. 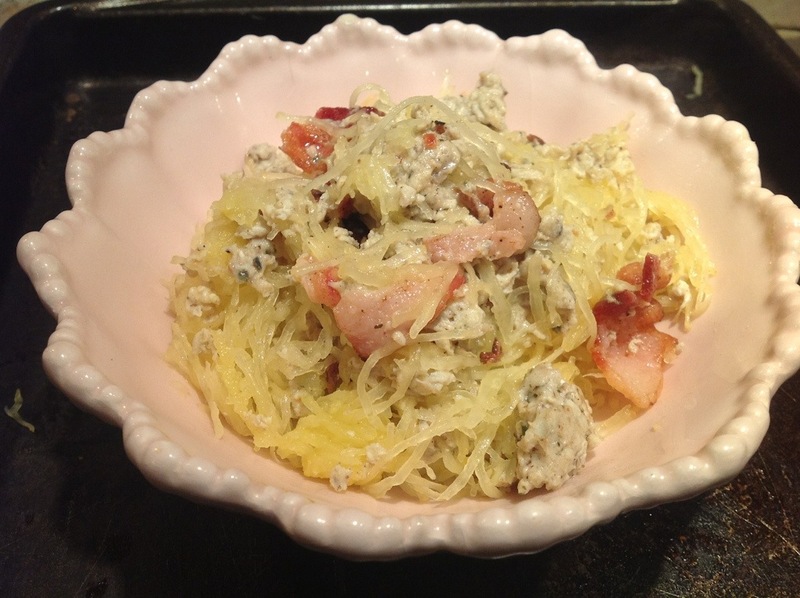 Scoop out spaghetti squash, add the tablespoon of ghee, and combine with bacon and egg mixture.